Light or Dark? McSorley's wants to know. These are your only beverage choices, offered by a crotchety Irishman with a thick brogue, when you walk into McSorley's in the East Village. The beauty is that you can order either or both. How, you ask? Because each individual order brings two half-pint beers, pulled cold and fresh, with a healthy head. McSorley's dark ale is deep and caramelly and smoky. The light is crisper, as you would expect, very refreshing. Need another beer? The whole table gets around; that's just how it is. Don't like it? Leave. 'Course you'd be missing out, 'cos you can always leave some behind (though, more likely, someone at your table will drink what you don't). But you can't find this kind of camaraderie in many other pubs. The girl from three tables over might sit and chat about the boy she's trying to charm for 20 minutes. And you might never hear the story of the four generations of men sitting at the table across from yours. 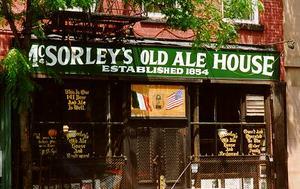 Grandpa's been coming here for 60 years; Dad was here when the court order came down in 1970 opening McSorley's to women; Son's been coming here since he was a boy -- a Ginger Beer and and order of fish & chips were his favorite meal watching games with his Pop. And now he's brought his 2-year-old son to McSorley's, and the little one seems to be walking in these men's footsteps as he chows down on beer-battered fish. I love me my Heinholds, yes. 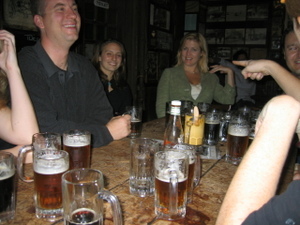 But McSorley's wins the award for best pub in the (city?) (country?) (world?) for all the reasons one seeks a pub: liquid therapy (a great beer that's only improved by hot salty tears), a new-best-friend-for-the-night (to hear how crappy your day's been), and a volume level that drowns out your sobs. All topped off by a barkeep who, with one sentence, can make you laugh so hard you snort beer. Oh, and did I mention they've been around since 1854? That's a lot of time to perfect one's art, don't you think? I love, love, love McSorleys. And plan to stop for a beer and some fish & chips before leaving for the airport tomorrow afternoon!